The NAB Cup kicks off this Friday with Collingwood, Essendon and the Dogs. YOU LITTLE RIPPER! I for one will be there armed with by best set of binoculars, notepad and pen. The NAB is all about keeping a keen eye on those players that you have identified so far in the pre season as well as keeping an eye out for any fresh meat that might give you the edge in Supercoach and AFL Fantasy. Also – read Jock Reynolds Community leader Vince Gambino’s mid priced player write up from Thursday? Well worth a very serious read. Thought it fitting that I provide my beloved community with version 2 of the 2013 mid priced cheat sheet. And for Christ’s sake… do not miss the podcast every Sunday night. The Jock Reynolds Fantasy Footy Community Podcast has taken scores of fantasy strugglers into the upper echelonia of the AFL Fantasy Footy elite. We are delivering a podcast every week already folks… make sure you tune in late on a Sunday night! Interesting point zane. Let's not get ahead of ourselves on the outcome of the investigation, but as you say JB has not handled pressure situations well in the past. I can't imagine it's a pleasant working environment at windy hill at the moment. How will that effect him.? Next question.. If my gut feel eventuates and history repeats…. Shaw or Waters? I’m giving Broughton another go this year. Still got plenty of potential and his struggles last year seemed more caused by the positions he was played, rather than something on his part. New team, New coach, No Ross. Im going to give him another go this year. Will watch in the NAB for any signs of him playing a similar role to last year. But if not he's a lock for mine. Broughton will be a yes from me. Nice work mate! Hit the clubs last night? Taking a punt on Monfries over LeCras at this stage. Could be some nice scores if he gets some game time in the middle, and with Ports average midfield, I don’t see why he wouldn’t. General rule for mine is stay away from Port players as they have been one of worst SC scoring sides the past few seasons, but there will be exceptions and I think they’ll improve overall this year. 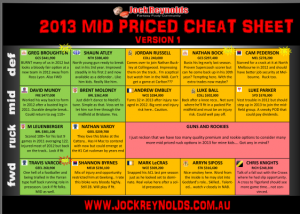 Another great cheat sheet jock. At this stage not really going with many mid priced players. Only Broughton and Leuenberger in mine (Fyfe aswell if you count him as a 'midpriced' mid). Going strong guns and rookies side mostly. But I am interested in a real bargain when it comes along, will keep an eye out in the NAB and if anyone really impresses, might just find a way to squeeze them into my side. I really like the way you are thinking there Benno – impressive. Hi Jock just want to get your thoughts on Josh Caddy from Geelong? Would he be a good selection as a mid price midfielder this year? Thanks. I started with a 5-0-5, then to a 4-1-5 now find myself with a 3-3-4. I know what you mean jimbo, changed my midfield set up atleast 100 times so far. At the moment running with 5 ultra premiums, 1 who I think may become one (Fyfe), and 4 rookies. Will probably change another 100 times until the season, but I'm liking were it is now. I'm sitting here looking at the side knowing full well that I will turn it back to a 4-1-5. The problem is I can't decide if I want Moloney in there at M6 or not. What is your midfield Jimbo?? Got two school of thoughts. Can you guys advise? Really the difference is Swan and Stevens Vs Mundy and Moloney. It is a bloody interesting time of the year Jimbo! I can tell you that even my team is changing shape on a day to day basis mate! Alos would love some news on Andrew Krakouer. Real keen on him in my team. Hey Jock, i'm curious to know if my team is of a stable structure. My strategy being 2-2-2, 4-1-3, 1-1 & 2-2-2. Plus rookies filling up my bench in all zones. This is my third year of playing Supercoach, and all signs point to a breakout year haha. BJ, Gibbs, D.Pearce, G.Broughton (Your influence), J.Russell, Vlastuin. Gablett, Spendles, Cotch, Murph, Moloney, B.Crouch, Jaeger Bomb, Viney. Pavlich, Rockliff, Robinson, Martin, Varcoe, Sammy mayes. Any input would be much appreciated. Cheers mate. Absolutely love the cheat sheets mate. I've got a few more for you Jock to run the rule over. Sam Frost GWS def. – under 300k played 3 games last year 92,59,72 – I'm taking the punt if he looks like a round 1 starter. Andrew Krakour – dead set under priced this year. average 80+ easily, more time in the mid too??? Orange Gorringe – my dark horse. Talk of him pumped up for a big 2013 and spending time up front. Gorringe, i hope, will be the new giles. LOCK HIM IN! hodge will be a very dangerous choice, will be eased back in…..wont play straight away. when he does will be green vest and then move up to the rest vest……consider around the bye perhaps if all goes well. Krakour wasnt on the radar but after last weekend is now on the watchlist. just can't see whose spot he would take with Varcoe locked at M5. Gorringe – well the second line of the article could be a warning sign? "With a host of leg injuries ruining his first two AFL seasons,"
nice to see some point of difference. That's what I try to do. I disagree that Hodge will be eased back in, the did that at the tail end of last season and he played the finals too. Unless he's suffered an injury pre season he's dead set on the field and captain of the hawks too. I just question his aging leg output, can consistently bang out tons again??? And look at that, the herald sun reporting my top tip Cunnington is looking the goods. Lots of ppl I know going for Atley, not sure why, but it's widespread enthusiasm for a breakout season. Pearce,not for me. Harper – NO idea. Then who should I put instead of Pearce in the mid? Swan,Kennedy,Dangerfield,Murphy – the rest, well it's trade secrets my friend! Which Pearse Mate? Clancee or the New guy to Port? I f its C pearse HOLD on to him if its d pearse Pt Adl trade now get onto Cunnington Nth Melb…Swallow could go to mate He has a hard time with Tag and Fwrd pressure by Def. just a quick question for the community do you think we will see Shaun Atley rotate through the midfield this year . I think Ates will definitely push up in the middle, on many occasions we have seen the run and carry of Ates on the wings. Got some pace, and all round footy smarts. I'd say he'll be a bonified dual position player in 2014. I'll tell you this much, wait and see! To much risk for early selection when you've got guaranteed cash cows up fwd like – maccaffer,krakour,lecras,kennedy,varcoe and even Kerridge I reckon. No harm done in waiting till rd 3. Also have 35,800 in the bank. I reckon I'm alone here,but Jaeger bomb will not be the cash cow everyone is saying he will be. Mail I received is he's still prone to making mistakes and might not crack it for rd 1. Wait and see I say. Maybe go for that kane mitchell fella. ALso I'd play Kerridge in FWD line. I should I say – I am. Oh really? There's a heap of hype about the Jaeger Bomb, i was worried he probably wouldn't get a whole lot of game time.. So put Kerridge in FWD and chuck Mitchy in the guts? On a side note do you think my team is stacked alright? Goddard or heppel – broughton – rookies for the rest of the backs. And buddy, plus the injury return guys. like kraks maccaff le cras. and the blanks you see, I change every 4 hours! IMO Kerridge is good either fwd or mid. But I'm leaning towards fwd so I can move into the mid when i trade out a midfield cash cow. I know what you mean, i'm finding myself changing my squad every 4-5 hours. So you're swapping out BJ for D.Hepps? Hopefully he has a breakthrough. I'm still skeptical about my Midfield. Scared the floor will drop from underneath, and my squad comes crashing and burning haha. Yes about Heppell although I think BG will outscore him more often than not. I'm going heavy in the mid (like most ppl) and I should also say I'm playing BIG COX in the fwd line with buddy. I feel I'm close with %80-90 locked in for my team, but it's those fringe guys that are the problem. Cunnington,caddy,fyfe,hodge all a chance of doing something great this year. Hey guys, anyone like Josh Jenkins as a cheap forward lock and backup ruckman? I thought he wasn't bad in the NAB cup game, not a bad season last year either. Hi Guys, With so many of the rookies being mid only, im stacking my back line from the start. Means ill only have 1 upgrade to make in defence. Also means I only have 3 ultra prems in the mids, 1 mid pricer (Maloney) and rooks. Anybody else going this way? I usually go for a nice spread, but I just dont see the cows in defense this year? Thoughts? How do youreckon Josh caddy will go? I have gothimin my mid? hey fellas I'm almost 95% on my team for this year opinions and adjustments would be appreciated.